Moorhouse’s Brewery has crafted a commemorative 4.2% ABV cask ale to mark 100 years since the First World War Armistice in 1918. In support of the Royal British Legion, 10p of every pint sold of Moorhouse’s Armistice will go to Whalley Remembers — a series of fundraising commemorations to remember those who fought in the war. Whalley resident Cliff Ball had the idea for Whalley Remembers in early 2017 and called a public meeting in February this year to discuss the idea. More than 50 people attended and a committee was formed to create a programme of events fitting to remember the 60 young men from Whalley, Barrow, Wiswell, Billington and Mitton lost in the First World War, and the contribution made by the Queen Mary’s Military Hospital at Calderstones, which treated some 60,000 wounded servicemen. The Whalley Remembers programme of events comes in two parts. Firstly, the Saturday before Remembrance Sunday will be a lighter occasion, with a heritage walk including the unveiling of blue plaques at places associated with the war, a lantern walk led by the uniformed organisations, a First World War concert in the village hall, and the lighting of a beacon on the Nab with fireworks. Remembrance Sunday will be more contemplative as the group remembers the fallen from the twoworld wars and Northern Ireland. There will be a service of thanksgiving in Whalley Parish Church, followed by a parade to the war memorial where there will be an act of remembrance, including two minutes’ silence. The parade will then return to Whalley Abbey where there will be a community hotpot lunch. 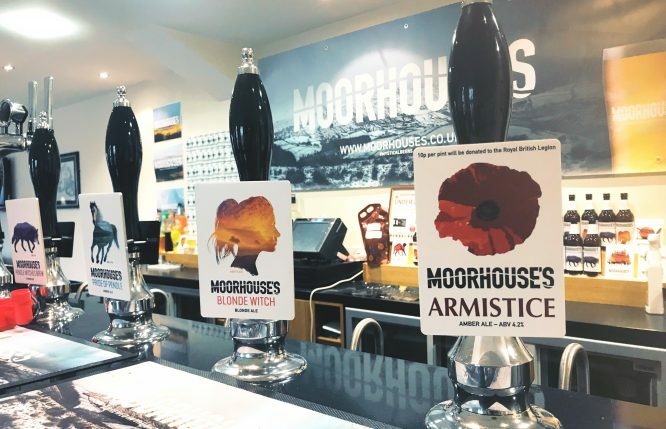 Upon receiving a call from Cliff, Burnley-based Moorhouse’s decided to pledge its support by brewing an ale, with part of the proceeds going to the Royal British Legion. The amber ale has sweet malt, citrus on the nose, with a hoppy aftertaste. It will be available in a select number of pubs for a limited time, including: The Dog Inn, Whalley; The Railway Inn, Hapton; The Strawberry Gardens, Fleetwood; and the Pendle Witch, Atherton. Moorhouse’s Brewery managing director, Lee Williams, said: “We wanted to both recognise those men and women who have served for their country, and also raise money for this great cause with our Armistice ale. Cliff Ball added: “We’re enormously thankful for the support of Moorhouse’s Brewery and have enjoyed sampling the Armistice beer in our local pub, The Dog Inn.